You are always welcome at First Unitarian of Providence. We are embracing of many beliefs, welcoming of all genders and sexual orientations, and accessible to people of all abilities. We strive to change lives for the better. Joining us for worship? To learn about what to expect in our Sunday worship services, click here. Interested in our programs for children and youth? To explore our Sunday morning classes and groups for nursery through high school, click here. Wanting to find community? Check out our events listing by clicking here. Browse our connection pages to find other ways to get connected. As you explore our website and learn about us, feel free to contact us with your questions. We look forward to meeting you and helping you find what you need. 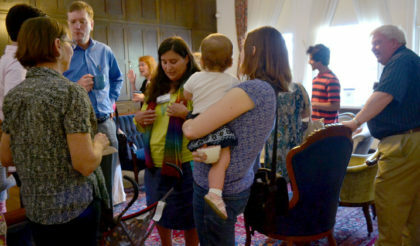 Newcomers Café is a welcoming space for those new to First Unitarian. Church members and staff help to facilitate informal connections and provide information about the church. The Café is held in the Parish House, in the Paneled Parlor behind the fireplace during coffee hour at 11:30 am, following the service. All are welcome. Welcome tables are located on the left as you enter the front door of the Meeting House, in the hall of the Parish House, and in the Newcomers Café. They provide information about First Unitarian and Unitarian Universalism. Guest registry and newcomer forms tell us you’d like to know more about our congregation and make further connections. Guest forms are at the welcome tables and in the Newcomers Café. Newcomer forms are in the order of service. On these forms you can request to receive the monthly e-newsletter, have a reusable name tag made for you, and/or be contacted by a church leader. Guest/visitor name tags are encouraged and help us get to know you. Greeters wearing colorful rainbow scarves are available to meet newcomers and answer questions before worship at building entrances and during Coffee Hour. Purple/blue mugs at the coffee and tea stations indicate that you’re new or would welcome being approached for conversation and connecting. Visitor & handicap parking spaces are available in our Benefit Street lot in marked spaces next to the building, and on Benevolent Street across from the Parish House. Our Meeting House and Parish House both have wheelchair access from the breezeway between the buildings, which you can reach from the parking lot or from Benevolent street. Hearing enhancement devices are available in the Meeting House – just ask the Ushers. Large print hymnals are available in the Meeting House – again, just ask an Usher. Accessible bathrooms are located in the Parish House. We have a gender neutral bathroom located in the Atrium and Parish House second floor, accessible via elevator or stairs.